Ashford & District runners faced the tough hills and mud of the 9th 666 Trail Run on Sunday. 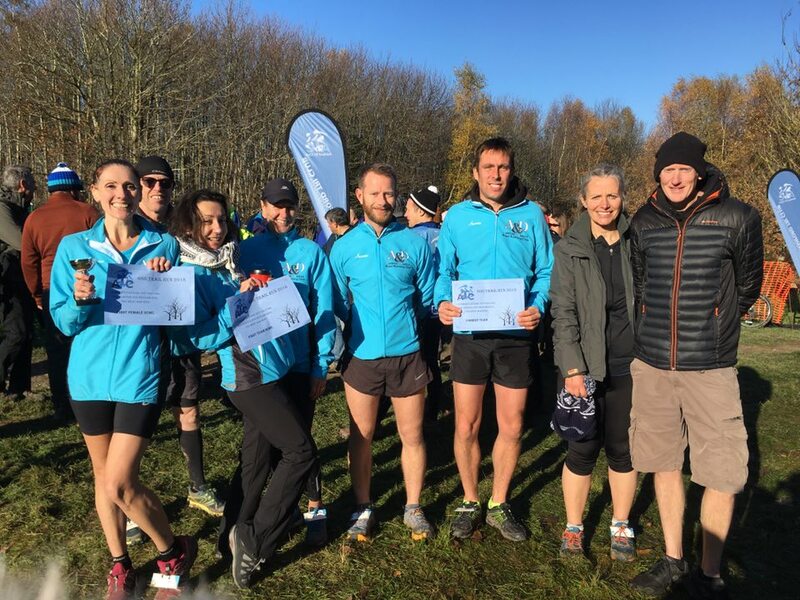 The course covered 6.66 miles around Challock’s Kings Wood and saw A&D take home prizes for being both the First Team Home and the Biggest Team. 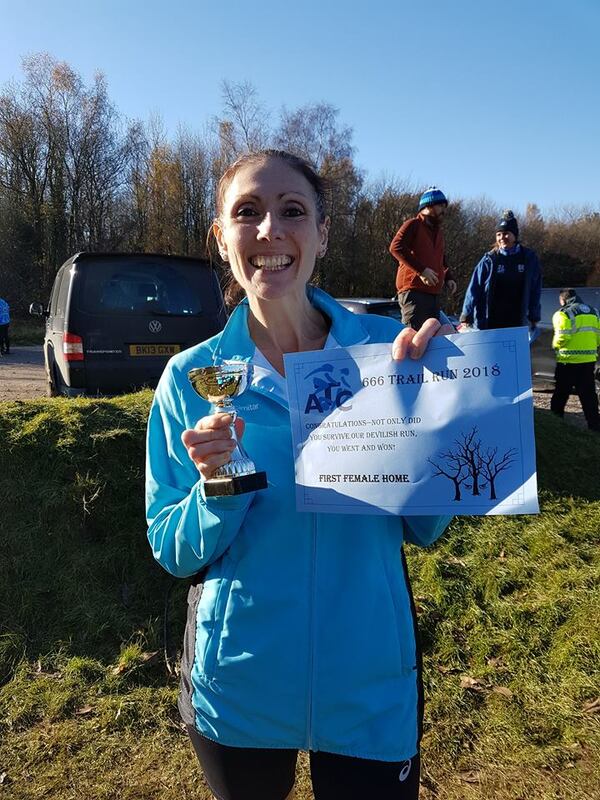 Having achieved her first sub-20 minutes 5K only the previous day, Becks Macey continued her excellent form by claiming 1st place in the ladies’ race with a time of 53:37. Elodie Paviot was 2nd lady home in 58:17, followed by Tracey Calnan (1:01:41), Claire Green (1:08:51) and Ailis Goddard (1:27:27). Jon Pearce was 2nd overall and 1st in his age category, with a time of 47:08. Dan Green was next, making him 3rd overall with a PB of 47:51. Paul Ridley followed with a time of 51:04, making him 9th overall. Paul Moses was 1st in his age category and 13th overall with a time of 52:11. Rob Barton was next over the line in 54:42, with Adrian Moody (54:54) close behind. Sophie Edmonds completed the Marden Half Marathon in 2:00:43, taking 11 minutes off her previous best time on the course. On the Hampshire coast, Steve Hickman ran the Gosport Half Marathon on Sunday. Hickman finished the sea-front course in 2:02:04. Two club members completed the Bedgebury Half Marathon, covering 13.1 miles of undulating forest trail. Hugh Scarlin finished in 2:26:52, followed by Sarah Taylor in 2:28:03. Three club members ran the 5K trail race with their canine counterparts on Saturday. Christine Costiff (with Rufus) was 2nd overall in 26:06. Shaun Snowwolf-Harris (with Loki) was 10th overall in 25:30. Clubmate Shelly Blake (with Teeko) finished in 34:55. Several of the club’s runners achieved personal best times on the course around Victoria Park on Saturday. Trevor Kay was 1st over the finish line in 17:40. Becks Macey achieved a stunning PB of 19:55, making her 3rd lady and 8th overall. She was closely followed by Paul Moses (19:56) and Scotty Lynch (20:00) in 9th and 10th place, respectively. Elodie Paviot finished with a PB of 20:55, followed by Mark Attenborough in 21:27 and James Chapman in 22:01. Darren Fagg achieved a PB time of 22:11, followed by Ian Grundy (23:01), Stu Nunn (23:19) and Mark Cleworth (24:45). Another PB was earned by Keith Lynn, with a time of 25:13. John Fidge (25:57), Marina Danckwardt (28:16) and Ann Fidge (29:08) were next over the line. Lesley Moody finished in 30:44, followed by Becky Hodgson in 34:11 and Julie Foster in 42:35. William Whittington completed the 5K course along the River Medway in 26.18; Emma Jenkins finished in 33.45.